Some Mac users may want to clear caches and clean out temporary files from Mac OS. Caches and temporary files can include things like web browser cache and history, messaging cache, app specific temp files and caches, partially completed downloads, and much more. While most apps will handle cache management on their own, and Mac OS will handle some other cache type files directly too, more advanced users can manually intervene and clear out their own cache and temporary files from a Mac as well. 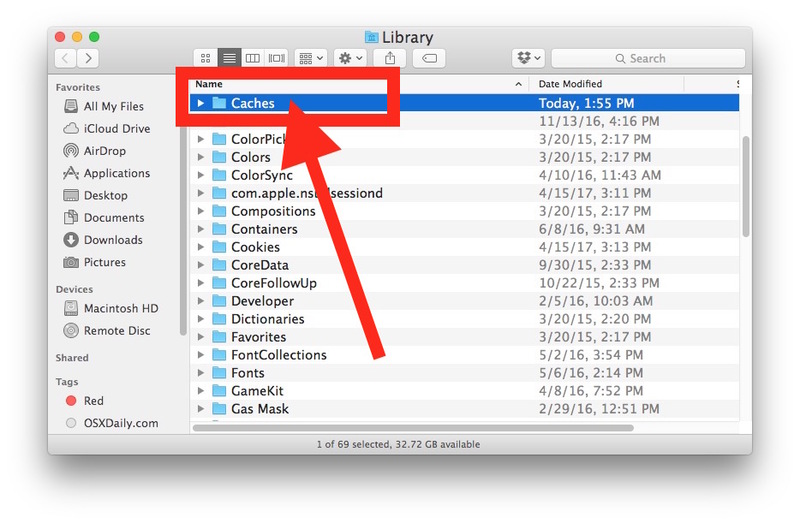 This walkthrough will show you how to manually clear and clean out caches and temporary files from the active user on a Mac. There are no downloads or third party tools required. To be clear; this is not a recommended task, nor is clearing caches and temporary files on a Mac something that you should need to perform. Generally you’d only want to trash caches if they’re hogging a large amount of storage capacity, or if a particular app is not functioning properly or is serving stale data served from old cache. 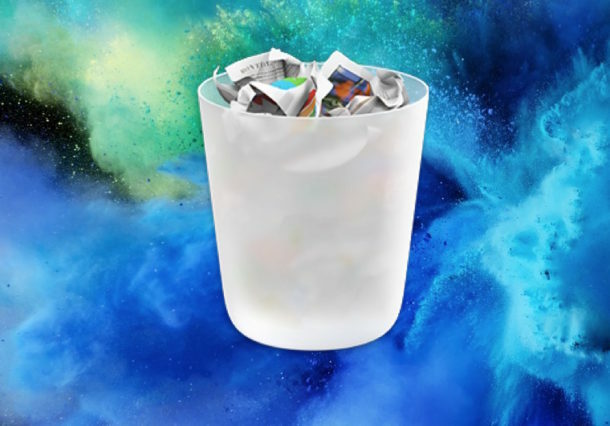 Despite what some “cleaner” apps might claim, cleaning our Mac cache and temporary files is not going to give your computer a magical super performance boost or make you more popular with the ladies and gents, all it does is remove temporary files from the computer. Sometimes it might help particular app performance, but usually it does not. If you don’t have a specific reason to clear Mac caches, don’t do it. You should always back up your Mac before performing any procedure like this. Backing up insures that if you mess up, or if something goes awry, you have a recent backup handy to restore the computer to. Do not skip making a backup. 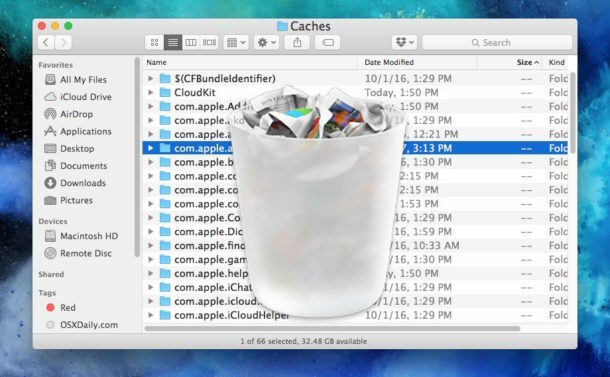 * The caches folder will contain many nonsensical file names and folder names, with names like “com.apple.iTunes” and “com.apple.Safari” and many others. 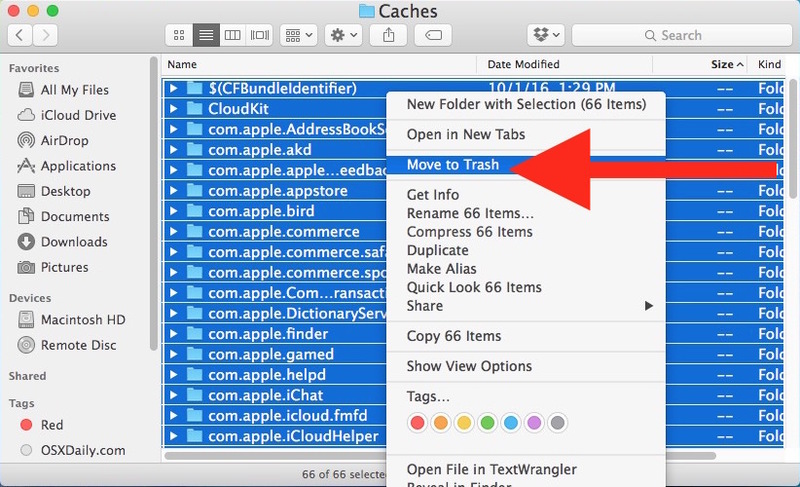 To find a specific app cache, you’d look for a folder of file that matches the name, for example the contents of “com.apple.Safari” would contain the Safari caches. This caches and temporary files folder is not intended to be user facing or user friendly, so don’t expect it to be. If you are aiming to clean out web browser caches, a better approach is to empty cache in Safari on the Mac or empty cache in Chrome on the Mac, both of which can be done directly from the web browser apps themselves. As mentioned multiple times, it is not necessary nor is it recommended to manually remove and clean caches yourself like this, unless you have a specific reason to do so, typically for troubleshooting. The above method covers deleting and cleaning out caches and temporary files from the active user account, but the Mac system software and system level apps can also create temporary files and cache files. There are various system level cache files and folders and most of them should never be manually interfered with, doing so can result in all sorts of unexpected behaviors or worse. So what should you do? Rebooting triggers specific system maintenance tasks in Mac OS that automatically and safely deletes Temporary Items and the /private/var/ folders in Mac OS with zero manual intervention of effort. This includes Mac system caches like sleep images, swap and virtual memory, tmp folders, completed software updates, Mac App Store caches, and much more. Do you have any particular experiences, opinions, or thoughts about clearing caches and cleaning temporary files from a Mac? Let us know in the comments! Asking in a completely unrelated article probably won’t get the answer you want. A good place to ask this would be in the Apple Community forums – go to apple.com, click the Support tab at the top, and then scroll down to the Apple Support Communities. I’m not sure if there’s a specific podcast forum, but perhaps the itunes one would work. Fast forward podcasts the same way you do music. Seriously if you can’t figure that out, you need to sell your computer IMO. It’s unlikely that caches are causing a computer or app to crash. You can open the “Console” app right after an app crashes in Mac OS and search by app name to give you a hint of why it may have crashed. It’s very technical, so it’s not always obvious. Typically updating an app or system software will remedy crashes, rarely the caches are related unless something is being reloaded from cache that is causing the problem. I do not have an ALT key on any of my Apple keyboards. Do I need to buy a Windows keyboard in order to do this? Wait. I see alt in small letters on the Option key. Why did you not call this key what it is really named? Correct. On my South African Mac the key is labeled as “alt” only. Rather than trash the files, put them on another drive in a folder appropriately labeled. If something goes incredibly wrong, you might be able to recover by returning one or more. Writing a note-to-self explaining WTF you did would be wise with the url of this page. It is well and good to advise how to do things but when ‘library’ is not listed under the ‘Go’ Menu your instructions are of no use. This has been the case previously on other ‘fixes’ where the menu item is not listed. I have the latest version of Sierra installed but it is like Apple have differing versions throughout the world. 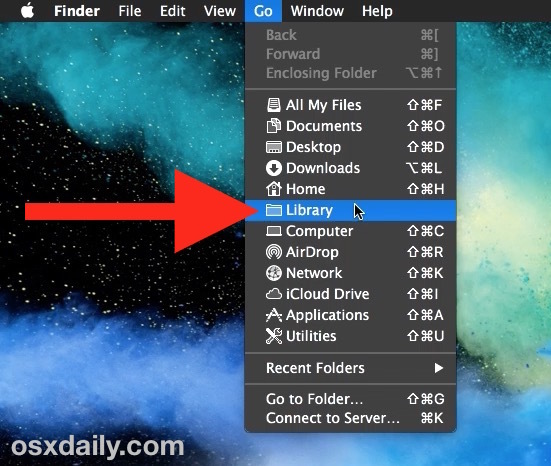 Apple decided to remove this feature, clicking on option/alt along with the GO from the pull down menu no longer allows you to gain access to the “LIBRARY” folder in the most latest edition of Mac OS, called, MacOS Sierra. The author of this article wrote it back in October 2016, when it did still work for the prior Mac OS, called OS X Sierra. If you could update this article with the correct method of accessing the Library folder to clean out the cache, I would greatly appreciate it. Thank you. Anyway, Shift key for the latest MacOS versions. Option key for older ones. I have Sierra 10.12.4 installed and to see the library folder I still use the “alt” key. The shift key shows a greyed out option of “Select Startup Disk on Desktop”. Again, this may be a different thing in the international version. Can you share some pointers on clearing up the following? When I started my new job, I made the mistake of using my personal Apple ID on my work Mac. I soon realized that my personal data was showing up on my work Mac — most alarmingly was the content of my personal Address book. To correct this, I logged out of my personal Apple ID in various apps on my work Mac and logged in with a new Apple ID for my work Mac. Those apps included iTunes, iCloud, Messages and FaceTime. I thought that had ended the problem of personal data showing up on my work Mac. But recently, I just happened to do a Spotlight search on the term “Apple ID,” and found that two of the search results were from my personal Mac’s Address book that included the term “Apple ID” in them — they are NOT currently in my work Mac’s Address Book. The full content of both of those Address Book results were completely visible in the preview, revealing personal data I do not want showing up on my work Mac. However, when double-clicking on those results, an empty Address book window opens. Are there any leftover files I can delete that will remove that old personal contact data connected to a former Apple ID, so they will no longer show up in a Spotlight search? I simply have no idea what to try next. Deleting caches will not impact your Apple ID. It’s best to keep your work and personal computers and logins separate for many reasons, otherwise your employer may be able to access your emails and data, and yes if you use your personal data on a work machine that may cache on that work machine. FYI in Sierra, the Library folder is revealed in Finder “GO” menu by holding down the SHIFT key, not option/alt as in the past. Yes, it’s the Alt key. I used it today March 18 2019. Does it makes to list /Library/Caches in the Time Machine exclusion list? The /Library/Caches folder is system level and is different from ~/Library/Caches which is user level. Realistically nobody should be messing around in either of them… clear your cache through web browsers, reboot the computer. That’s about all you need to do. CC Cleaner for the Mac works well too. Last thing I would do is delete the entire contents of the Cache folder. Instead, intelligently look at targets based on issues you may be experiencing to avoid unpleasant surprises. While that may be true, it does remove items, files, thingies from your computer which are not used for anything. I use OnyX for cleaning my Mac. I keep the app up-to-date in accordance to my OS upgrades, and will continue to use it on a regular (monthly) basis, until someone shows me exactly how it is causing me harm. The bottom line for me is that I do not want anything resident on my computer which I didn’t put there on purpose or which doesn’t offer me anything of value. This is the WRONG way to clear caches and such. The right way is even easier to do. Boot into Safe Boot by holding down the shift key and log in. Your done. Then restart and boot normally. If you delete the wrong files you could corrupt your system. There is zero reason to do this. Restarting clears caches, and there is a reason those files are cached. DO NOT DO THIS AS IT WILL SERIOUSLY SCREW UP YOUR COMPUTER!!!!!!!!! Restarting does not clear browser cache or many app caches like Spotify. And no, deleting your user cache files will not “seriously screw up” anything if done properly. If you don’t know what you’re doing or you end up in the wrong folder, you could mess something up however, which is why this is for advanced users and why everyone needs to backup. Much like an unskilled person should not be performing surgery or fixing an engine, they should not be digging around on their computer. Love this response. I conquer. Uninstall any antivirus. Those slowdown Macs to a crawl. Update OX, and restart puter once per week. What’s written will clear caches, but no need to go through manual clearing. Onyx is so much easier than all this manual stuff…. And can clear out stuff most people would miss and/or didn’t think they could do without. Don’t remove your anti-virus software…. Especially not if you do a lot of web surfing and use social media junk from your Mac. The virus part isn’t as crucial as the bundled malware, etc. that is bundled within the software. It’s also a good idea to turn on the Firewall feature built into OS X.